Typically racing games do not have or need a strong storyline. It is arguable that if people have bought a racing game, they want to race vehicles around a track, not play an action adventure. There are certain disadvantages including a storyline, such as once you have taken all of the available cars for a spin around every track, where is there to go from there? Mario Kart 64 has no discernible storyline – effectively, Mario and his friends have all gathered together and decided to race – that is simply it. 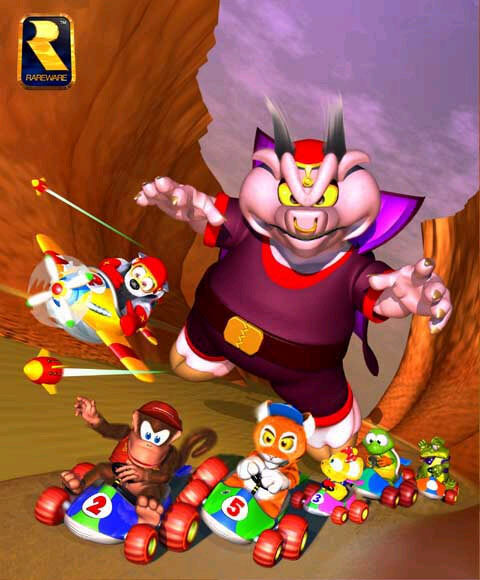 On the other hand, Diddy Kong Racing has a developed, all be it mental, storyline. It involves Wizpig, an alien pig from space, trying to take over an island that a tiger has been put in charge of… and there’s a flying elephant at some stage… it’s crazy. However, this injects a huge element of fun into the gameplay. When you have a known adversary to eventually race against, it spurs you on and gives you the drive to race again and again. This is what Mario Kart 64 is missing. The argument is that a single player mode that involves racing against the other characters again and again with minimal dimensions to the story don’t give you a drive to continue playing for hours and hours on end. Within Mario Kart 64, every track has been extremely well thought out and detailed, complete with the music reflecting the mood and feel of each track. You always know which track is your favourite and which one is your worst because they are all extremely distinct from each other. When looking at the racing courses on Diddy Kong Racing, so many tracks evoke a feeling of unremarkability. Having played both, I couldn’t tell you which is my favourite Diddy Kong course, but I can instantly recall my favourite Mario Kart track (it’s Toad’s Turnpike). The controls in Mario Kart 64 are, unfortunately for Diddy Kong Racing, unparalleled. Both the responsiveness and the terrain interaction match perfectly to give an accurate representation of each player’s ability at the game itself. 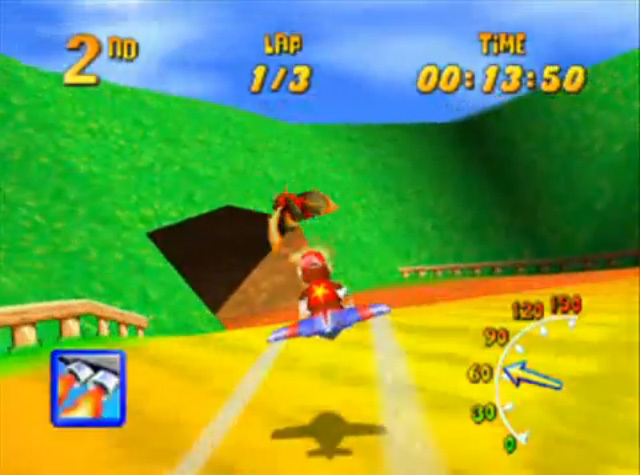 Diddy Kong Racing, on the other hand, struggles to match up to the same level of responsiveness, and the terrain can make the game almost unplayable on some of the (ice) levels. The vehicle selection in Diddy Kong gives you access to a selection of cars, planes, and hovercrafts. This, whilst giving more of a variety of gameplay to a gamer, has upsides and downsides. The hovercraft is extremely hard to control, cornering like a golf buggy on ice. The planes, although fun, have issues with certain tracks as it is seemingly impossible to turn a corner without crashing into a wall. Even with these detrimental aspects, the vehicle diversity keeps the tracks interesting and challenging. 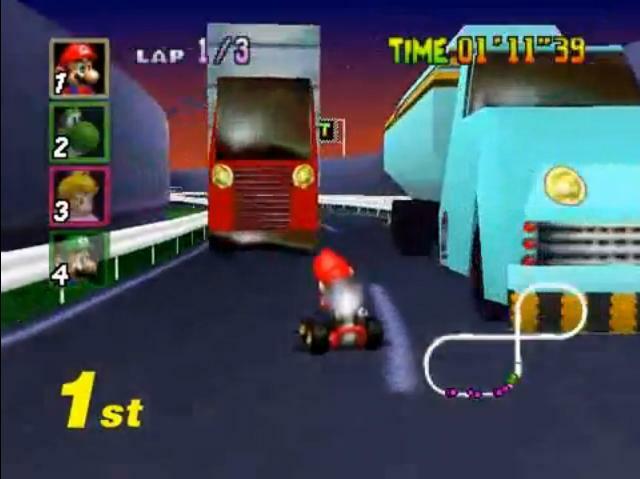 In Mario Kart, you can develop your technique with each character, but after playing the game for a long time you get so used to the tracks and vehicles behaviour that the game becomes less challenging. This can lead to getting bored with playing the game, which is obviously the opposite effect that the developers wanted. There is no discernible winner in this category; both games have a great multiplayer component to them. Mario Kart has been supported as being the better of the two for group racing and battle rounds, but I think this is more a matter of personal preference. Although both games have great attributes to them, I believe that Mario Kart 64 is the winner. This is purely down to reflective talent in the controls and weapon base that the game possess. Although Diddy Kong Racing has a great free roaming edge to the gamer platform, Mario Kart‘s developed tracks and notable characters are unforgettable. In the debate about what’s a better video game, sometimes the effort into developing and making them is forgotten. Product design consultants and software design companies work hard to achieve the best gaming experience for their audience base, and I think that they should be commended with both titles in creating two fantastic and distinct racing games. Crash Team Racing. I took a third option!